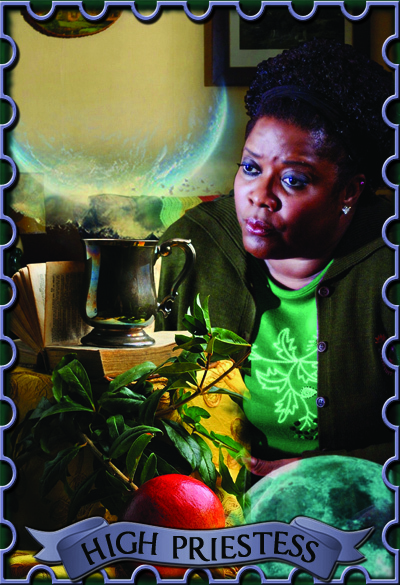 The High Priestess is the card of knowledge, instinctual, supernatural, secret knowledge. She holds scrolls of arcane information that she might, or might not reveal to you. The moon crown on her head as well as the crescent by her foot indicates her willingness to illuminate what you otherwise might not see, reveal the secrets you need to know in order to make a decision about a problem or a job, an investment, love, career, family, etc. And, finally, there is, behind her throne, the curtain that leads to the deepest, most esoteric and secret knowledge; the pomegranates that decorate it remind us of Persephone, who was taken down into the land of the dead, ate its fruit, and became the only goddess allowed to travel to and from that strange land. This indicates that when you get the High Priestess, you’re going to be learning some very odd things. Very odd. So I managed to incorporate the moons (albeit the wrong way round) and the pomegranate is there on the table along with the book symbolising her arcane knowledge. Now all I want to see is an episode featuring Missouri and a wooden spoon and I will be a very happy camper!